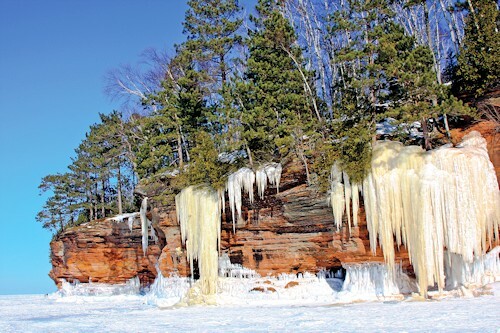 In addition to the ice caves, huge ice cicles (icicles) decorate the cliffs. February 20, 2019. 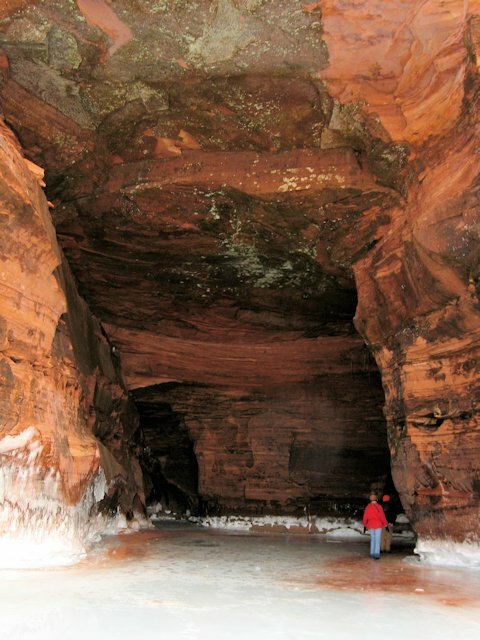 When will the Bayfield Lake Superior Caves open? 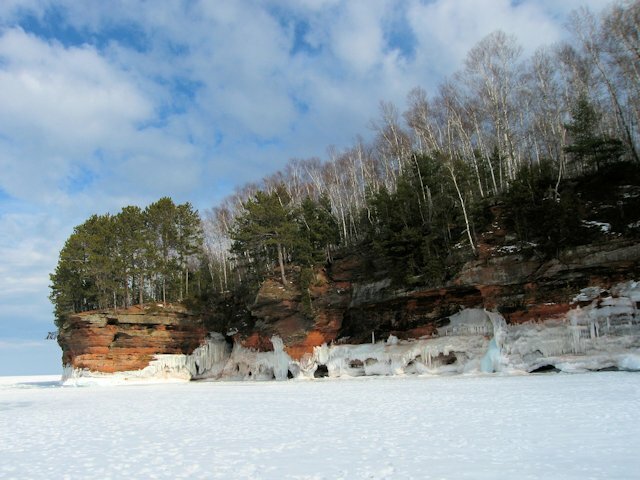 Looking much better as the Lake Superior Ice Pack has recently jumped to 70% coverage increasing the chances the Park Service will open up the Bayfield Mainland Ice Caves Trail. . . . cooler weather in Bayfield is in the forecast for the next ten days so we hope for a possible opening soon. For the most current conditions, see "Ice Caves Web Cam" link at the bottom of this page and check our Winter Weather & Snow Reports page for more detailed information. Opening and Closing. Watch this space for notices on when the US Park Service certifies the ice is safe enought to cross. Also for notices on the Madeline Island Ice Road. 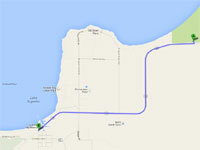 Alternate Route to visit the Ice Caves - see information at the bottom of this page. 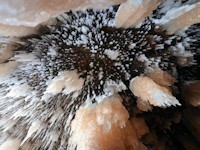 Contact Phone #s, Directions and Advice on touring the ice formations are at the bottom of this page. 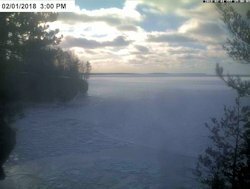 Madeline Island Ice Road is now open! 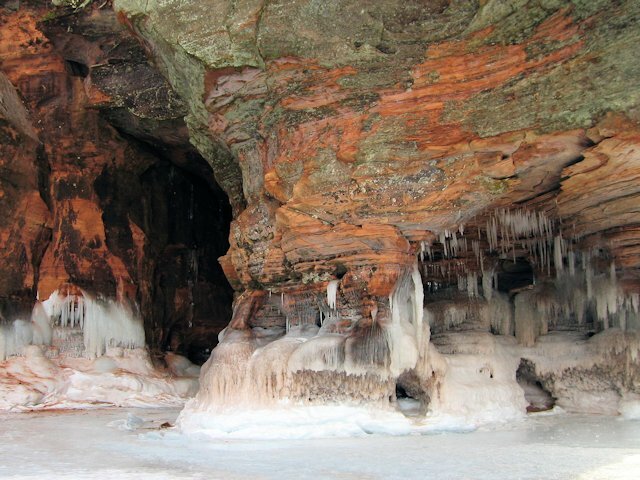 A popular Bayfield, Wisconsin winter attraction is touring the Lake Superior Bayfield Ice Caves of the Bayfield Peninsula. 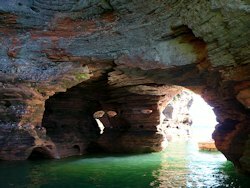 In the spring, summer and fall we've taken the hiking trail from the Apostle Islands Meyers Beach parking lot to the top of the caves and have caught some impressive views of the caves. During these three seasons, however, the best view of the caves is from the water . 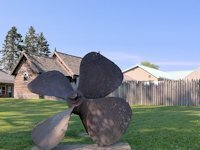 . . which is one of the prime reasons Bayfield is a popular kayaking center. 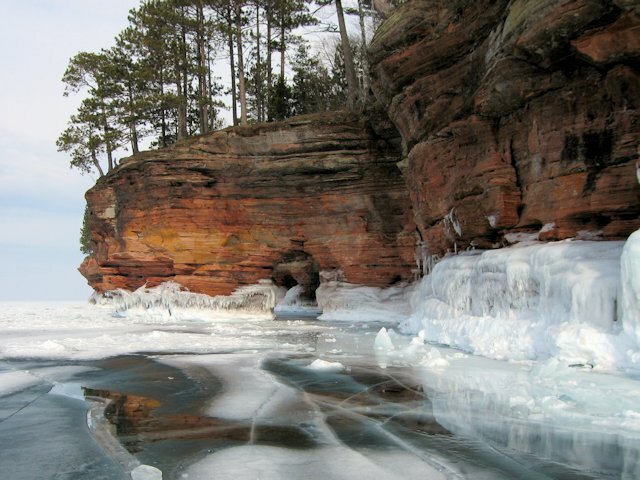 But winter makes the sea caves accessible to anyone willing to walk a little over a mile on the frozen beach and lake ice. It is fantastic, a really neat experience. 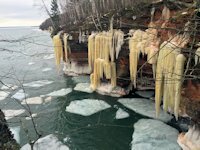 Every year Mother Nature sculpts unique formations in ice and snow which is why many people make an annual visit to the Bayfield-Apostle Island Park Ice Caves to see the latest exhibits on display. Visiting the Sea and Ice Caves. See our tips near the bottom of the page, below the photos. < < < A beautiful day out on the lake. If it were summer, a lawn chair, umbrella, and a nearby beer and brat stand would nicely complement the ambience! 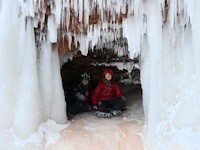 < < Kids have fun exploring the ice caves, These two crawled into every one they could fit in. 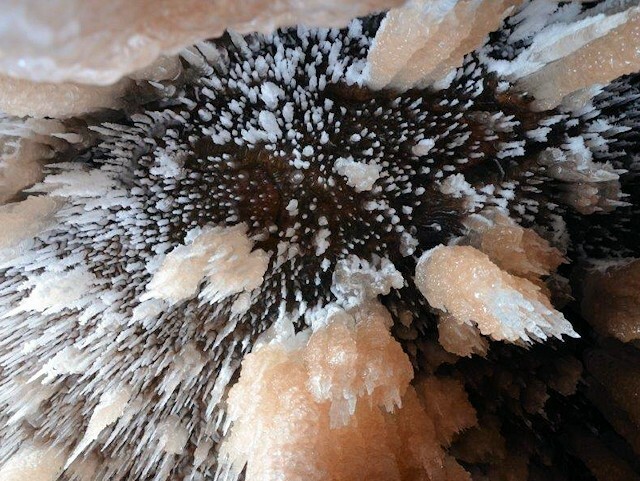 Looking up at some ice stalactites hanging from the ceiling in another cave. < < < In places the ice was crystal clear. Jo was afraid to walk on it even though it was quite thick. Another view of the same cave in a more recent year. < < < Jo inspects the south end of a deep crevace we have previously viewed from up above via the Sea Cave hiking trail. < < < Another picturesque view of the bluffs that contain the caves. 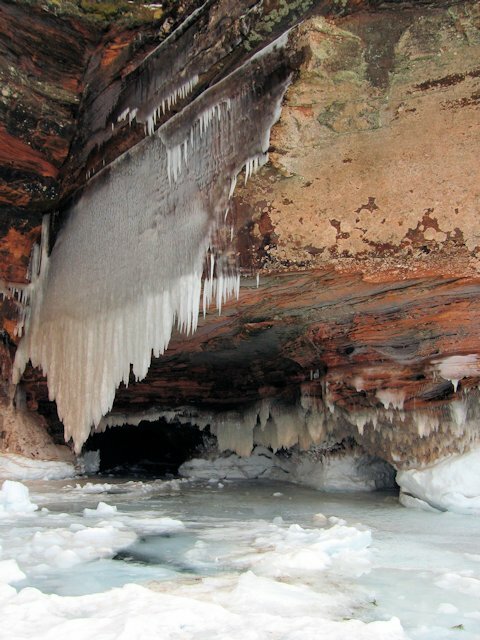 "Apostle Islands Mainland Sea Caves"
and a Video of Wisconsin's Lake Superior Ice Caves. 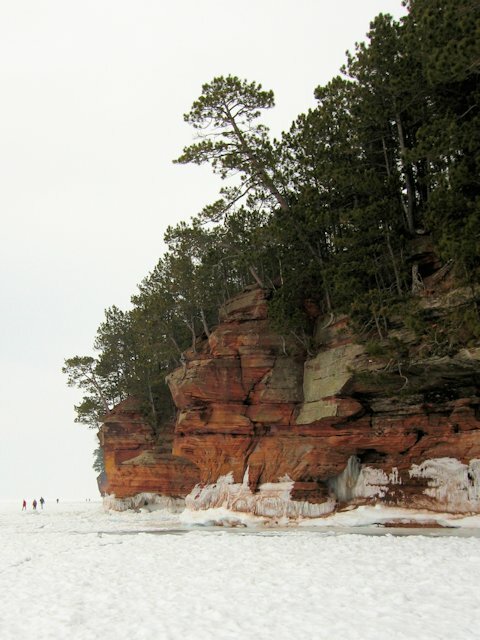 Lake Superior Ice thickness varies from year to year. 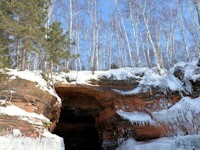 In 2009 as of Feb 1, the over-the-water ice cave trail was open and the ice safe enough to walk on and trail was well trodden by that time. But when I checked on conditions in 2011, by mid-February the lake ice trail had yet to be declared safe and for the rest of the season remained closed. In 2014 ice formed early and was safe by mid-January. 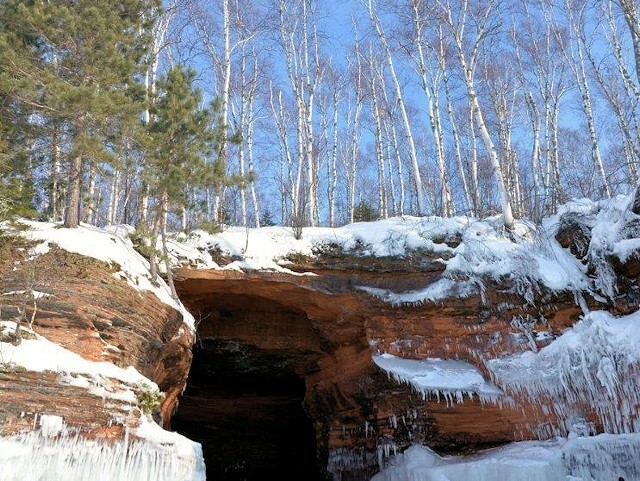 In 2015, the ice trail to the caves opened on Feb 21st. In 2016, the trail was close to opening mid-February but then winds and warmer weather broke up the ice and the Park Service did not certify it as safe. 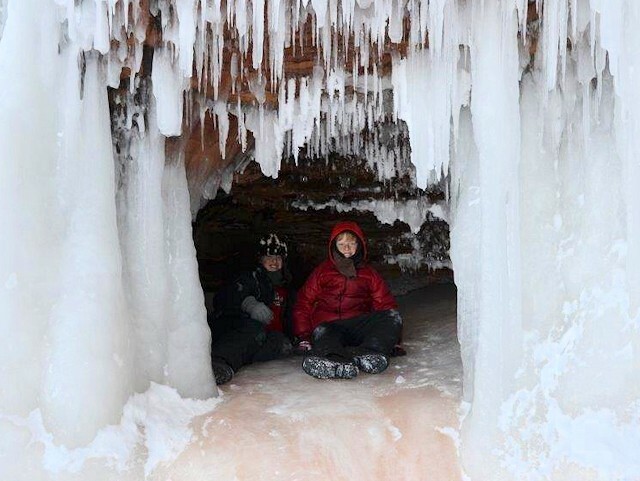 As of February 11, 2019 the ice to and around the Caves is still deemed unsafe but consistent below freezing weather ahead bodes optimism for an opening soon. 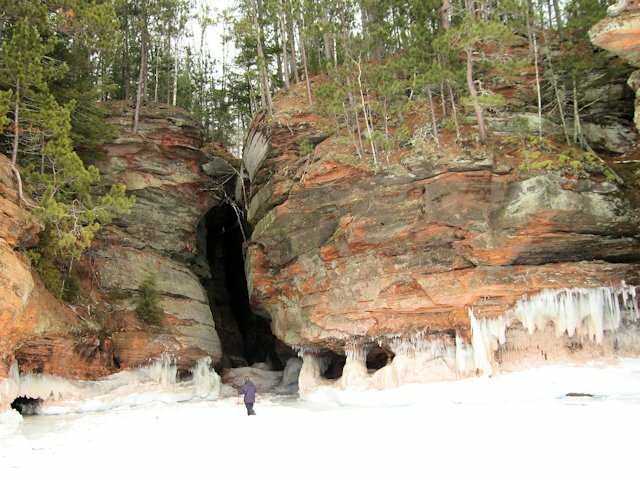 Are the Bayfield Ice Caves Open & What are Conditions? 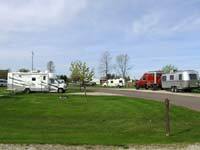 So if you want to check on up-to-the-minute conditions, the Park Service phone # is (715) 779-3398 x3. 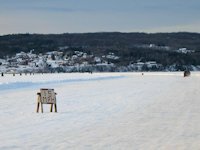 The Bayfield Chamber of Commerce also posts information on their Winter Recreation Report page. 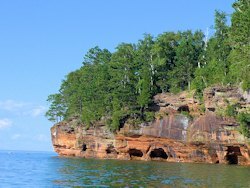 Another source is the Apostle Islands Facebook page. When you go, bring some beverages and bars with you because the hike to the caves, then touring the caves themselves, and hiking back can easily take a couple of hours. 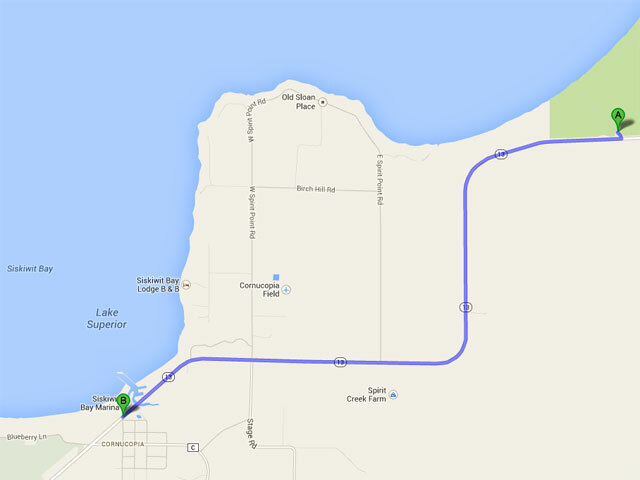 (You'll walk from 3 to 6 miles depending on how extensively you explored the ice caves) I've been told porta-potties are on site but it would be a good idea to take care of those "chores" before you get to Meyers Beach (especially on a weekend). 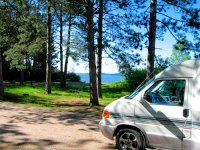 Also on a weekend because of parking out on the highway you may have to walk a distance before getting to the lakeshore. 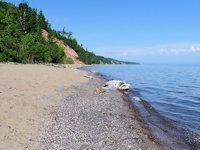 I've heard there are shuttle buses between Meyers Beach and Cornie but a good idea to check that out ahead of time either in Bayfield or Cornie depending on which direction you are coming from. 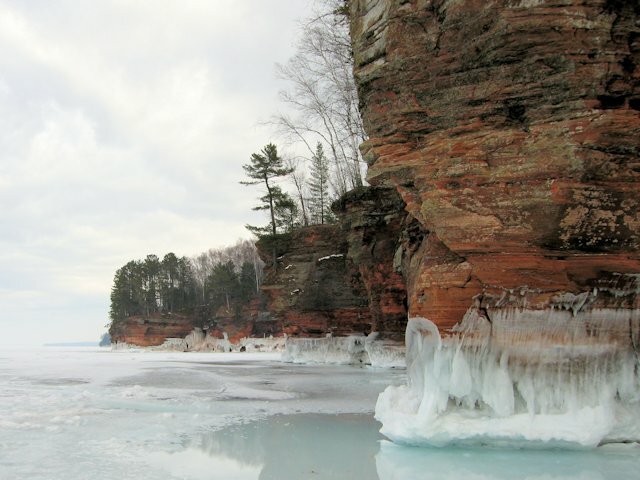 Ice Caves Volunteers - Thanks to the Bayfield Chamber of Commerce & Visitors Bureau and the Friends of the Apostle Islands for providing funds to maintain seasonal park service staffing for the Ice Caves. And the Town of Bell has volunteered to assist in keeping the Meyers Beach road & parking areas plowed and clear of snow. 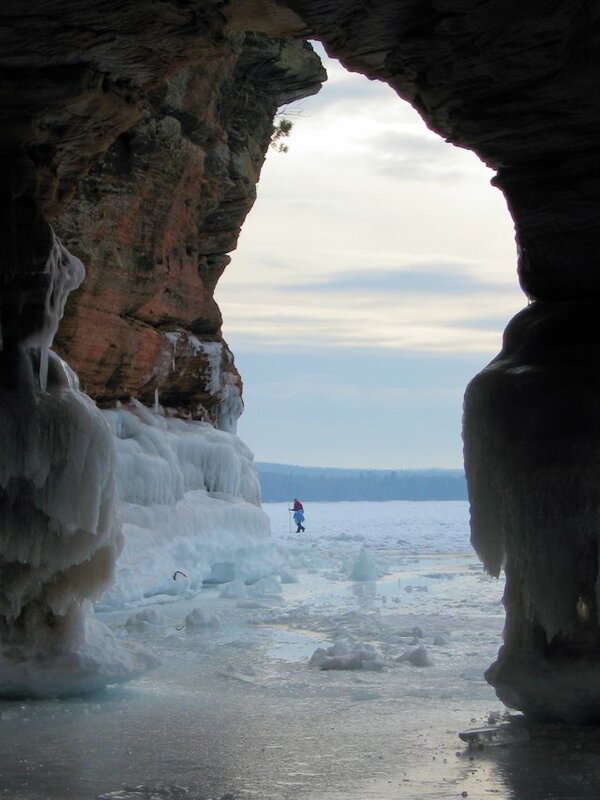 Pictures of Current Ice Conditions - The Sea Caves Watch website, designed for kayakers and boaters wanting wave conditions near the caves, also has value in the wintertime to see evolving ice conditions. 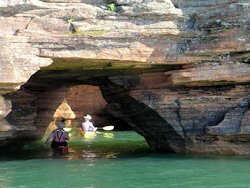 See the Sea Caves in the summer by Kayak or Boat Tour. 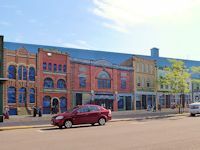 Ashland Mural Walk is an interesting attraction in nearby Ashland, Wisconsin. farms and orchards in the Bayfield area.